The November birth flower, the chrysanthemum, is one of the most popular flowers in the world after the rose. Known as the fall queen, this sunny bloom symbolizes joy and optimism. It’s the favorite fall flower for a number of reasons. Also known as “mums” or “chrysanths”, the November birth flower got its name from Greek words “chrysos” meaning gold, and “anthos” – flower. 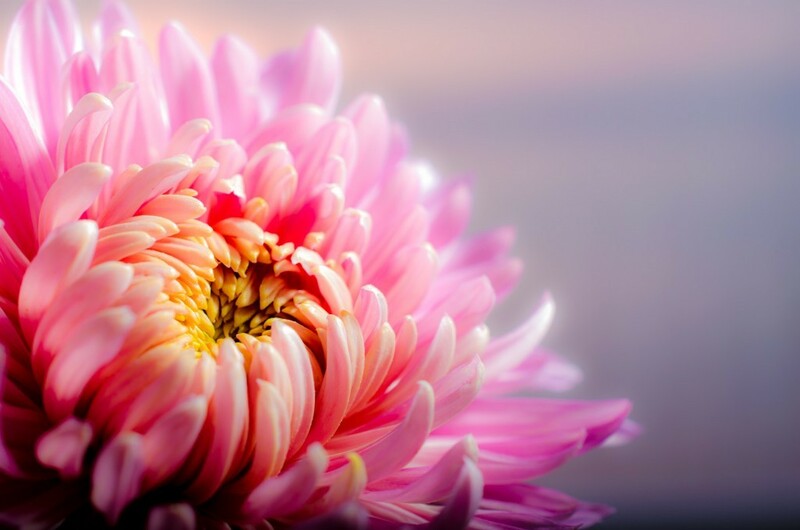 Although yellow and red are the most traditional chrysanthemum colors, cultivators have produced many hues, from white to purple to multicolored. Now there are around 50 wild species of chrysanthemums and thousands of bred varieties all featuring a bright yellow center and lush pompon-shaped petals. Surrounded by mythology and history as colorful as the flower itself, the chrysanthemum appears to have originated in ancient China. According to a legend, there was a small village where people lived to a very old age. Because of this, people thought the secret to their longevity was a mountain spring surrounded by chrysanthemums. Was it due to the flower’s supernatural or medicinal properties? It is hard to say. The one thing we know for sure is that the Chinese have used the bloom in herbal remedies since ancient times. Many believed the flower’s tea could ease cardiac and vascular disorders, as well as inflammation and fever. The flower still holds deep cultural significance in China, especially in art. One of the “Four Gentleman” along with plum blossom, orchid, and bamboo, chrysanthemums are one of the main subjects in Chinese watercolor paintings representing four seasons. Interestingly, Confucius also loved these blooms and called them the perfect object of meditation. Buddhist monks brought the chrysanthemum from China to Japan in 400 AD. Enamored by the beauty and perfection of the flower’s petals, the “Chrysenthemum Throne” viewed the bloom as their symbol and gave it the status of royalty. Today, this November birth flower is a national symbol, unofficial emblem, and the most beloved flower in Japan. Chrysanthemums appear on the Emperor’s official seal and crest, as well as the Emperor’s most prestigious military award. The Japanese even have a National Chrysanthemum Day in honor of their favorite flower. It is also called the Festival of Happiness, which is one of five ancient festival days in the country. The chrysanthemum first came to Europe in the 17th century. People in Europe loved the flower too, and adopted various meanings for it over time. – Victorians used chrysanthemums as a symbol of friendship. – In Buddhist culture the chrysanthemum possesses a powerful Yang energy and is used as offerings to gods. – In China, people traditionally give chrysanthemums to elderly people to wish them longevity or as a housewarming gift. It also signifies life and rebirth and has become a popular gift at baby showers and birthdays. – In Australia, “mums” are the official flower for Mother’s Day, which falls on the second Sunday in May. Chrysanthemums generally symbolize happiness, loyalty, and optimism, but the meanings may vary depending on the color of the petals. – Red chrysanthemums is the symbol of pure love, deep passion and a perfect romantic gift. – Yellow chrysanthemums signify unrequited love and grief. – White chrysanthemums stand for devotion and honor. 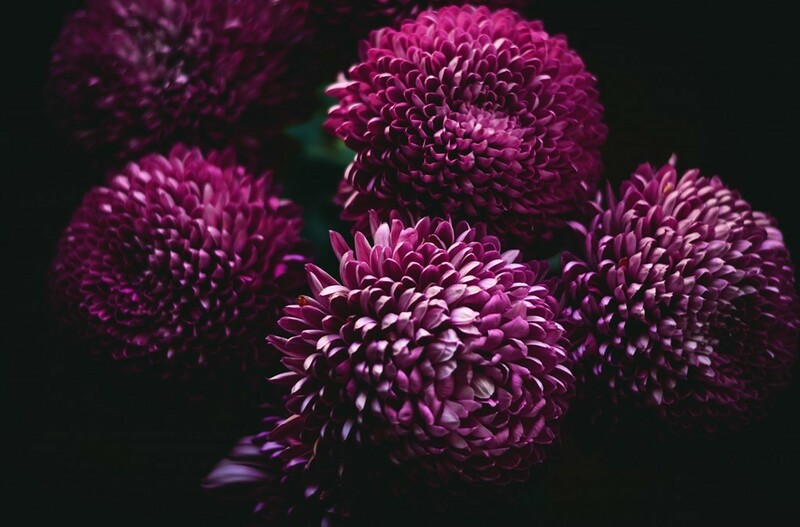 – Purple chrysanthemums bring wellness, and are great get well gifts. – Lots of people use November’s birth flower in cooking and medicine! It has many culinary and medicinal properties. 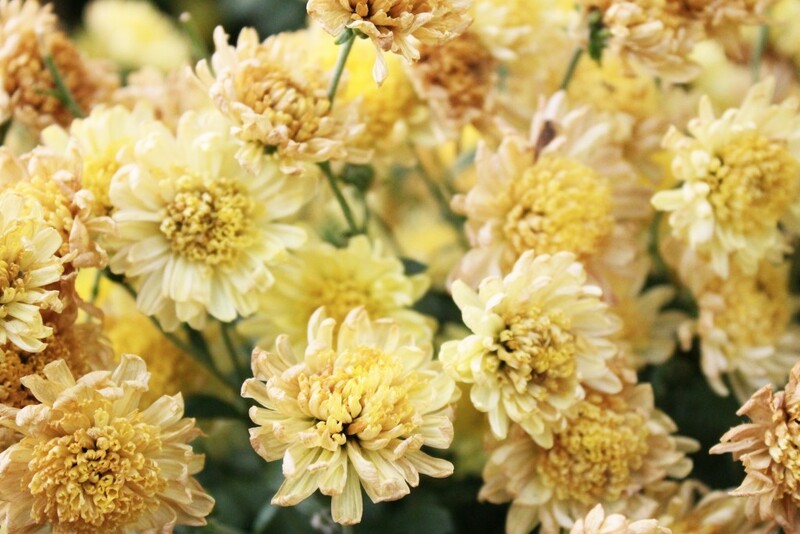 Chrysanthemum petals are fragrant and have a distinctive flavor. As such, they are often included in Asian dishes. You can even pickle them and add them to salads, vegetable dishes, and vinaigrette. Or you can use them to garnish dishes similarly to ginger. Boiled chrysanthemum leaves and stems are an integral component in Chinese cuisine. Chrysanthemum tea is also very popular and has a number of health benefits. Medicinal values include relieving acne and inflammation, headaches, sore throat, fever, facilitating digestion and curing some cardiac and vascular disorders. In Korea, practitioners use these flowers to treat inflammation, hypertension, and respiratory ailments. – Chrysanthemum flowers are an excellent source of vitamin C and beta-carotene. Besides, they contain minerals such as magnesium, calcium and potassium, all of which contribute to a good immune system. – Apart from being the November birth flower, chrysanthemums are also the official 13th wedding anniversary flower, traditional Mother’s Day bloom in Australia and the official flower of the city of Chicago. – A study conducted by NASA revealed that the chrysanthemum can help reduce air pollution. – Cut chrysanthemum flowers make a wonderful choice for a bouquet. They can survive for over 2 weeks in a vase. To ensure a longer lifespan, remove the leaves from the stems first, since they die much sooner. – Chrysanthemums are great flowers according to Feng Shui. They bring joy and laughter to the home and its owners. – In 2017 Japanese Scientists genetically engineered a chrysanthemum flower of a “true blue” color that has long eluded flower breeders and researchers. November features two sunny gemstones to brighten up this chilly fall month. November’s birthstones, topaz and citrine, are both known for their soothing energies. They are also though to bring warmth and good fortune to those who wear them. These gems are affordable, and both come in many colors and sizes. In fact, topaz and citrine look so similar, they are often mistaken for each other. A healing gemstone, citrine is often referred to as a gift of the sun for its range of golden colors that include juicy yellow and vibrant orange to rusty brown. The name itself comes from French and means “lemon”. According to the Chinese Feng Shui philosophy, citrine brings success and prosperity. It also promotes vitality and gives energy to the owner. Citrine is one of the most popular and affordable gemstones. It is easy to come by and available in a wide range of sizes and shapes. Citrine is a perfect choice for an eye-catching jewelry featuring larger gem. Such statement pieces will make a perfect birthday, anniversary and even wedding gift. It’s hard not to fall under the spell of enchanting topaz, which explains its mass appeal throughout centuries. Sunny shades of amber gold, red, as well as green, violet and pink are the most popular colors of this November birthstone. Vibrant orange with hints of rosy pink is the most stunning and sought-after variety. Called “Imperial topaz” after Russian czars of the 19th century, it’s definitely the most valuable and expensive topaz of all just like the gems that come in blue hues. Topaz birthstone (especially the rare blue variety) symbolizes love and devotion which makes it a wonderful romantic gift for birthday to a significant other. Some believe it also gives strength and intelligence to those who wear it. The boldest and most complex of the zodiac signs, Scorpio is a passionate and emotional type. Match their strong characters with gifts that have similar characteristics. While neutral items and delicate flower arrangements aren’t necessarily the best choice for this zodiac sign, people born under it will love statement gifts. Bold bouquets featuring strong gladioli, extravagant orchid or classic red roses are usually the right fit for Scorpio’s intense personality. To pamper this zodiac’s sensitive side, give them a relaxing spa gift basket or a chocolate hamper that are both great for lifting spirits and bringing joy. One of the most popular zodiac signs, confident and easy-going Sagittarians have it all: looks, brain and brawn. Always optimistic and adventurous, they love surprises and are easy to please. Gifts that reflect their multidimensional personality will be best received with Sagittarians. This zodiac sign is sure to enjoy an edible bouquet featuring colorful fruit or vegetables. Something more traditional, like a flower arrangement of vibrant carnations, gerberas or their birth flower chrysanthemums is another wonderful option for this positive zodiac sign. The cold season might make it hard to make your birthday celebration bright and warm, but fear not! A bouquet of vibrant golden chrysanthemums will definitely make your recipient’s special day more colorful and vibrant. This beautiful November’s birth flower is not only one of the most popular plants around the world, but also the perfect thing to bring a bit of warmth. Want to learn more about Birth Month Flowers? – Subscribe to our blog to get more holiday and birthday tips. – Browse our birthday flowers. – Share this blog using the social media buttons.